When I received a call recently for a couple who were interested in abseiling, I expected that I would just be in for another great day out. Then the caller really got my attention..."They are over seventy, but they are really keen!" That rocked me a little, however, after speaking to John Richardson, I knew that we were in for a special day. John is a spring chicken at 71 and has some difficulty keeping up with his wife Constance. 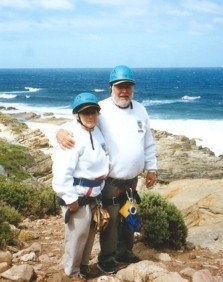 She was the instigator of the abseiling idea and would not hear of going anywhere but where the biggest and best cliffs were! "And how old is Constance? ", I asked delicately. Well, ladies never like to reveal their ages, however she let it slip that she is 76 years old! At just on 5 ft tall, she is one pocket dynamo! Despite a spot of drizzle in the morning, which was sorted out with a strong cup of tea, we were off walking to the Wilyabrup cliffs! This is no easy task with two stiles over fences, a creek crossing on planks and logs and a walk of at least 1 km! 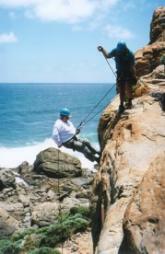 Thanks to Paul who joined us for the morning we all made it safely to the abseil site. After a quick safety brief and demonstration we were ready to take on the first abseil. Constance made sure that she was the first and seemed to find it really easy and had a look like "What is all the fuss about?" John also demonstrated fine style. With their new found skills under their belts it was time for the real challenge! The 10m abseil at Inner Space Wall! As the photos show Constance took to the challenge as if it were no more than a Sunday stroll! John just shook his head and told us stories of Constance's previous exploits, one of which involved punching a very large rugby player in the nose who did not demonstrate gentlemanly behaviour! As Constance said "That was all a long time ago". Thankfully my best behaviour seemed up to scratch and my nose made it through unscathed! 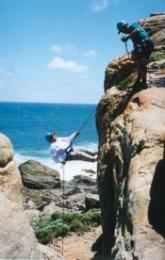 John was now under some pressure, and with much aplomb made the abseil in style. He is also the expert in the "Star Landing" which involves abseiling right down to the ground in the horizontal position and then spreading arms and legs wide to celebrate! Constance was already keen for another go and John knew that if Constance went again he had to follow!